Zombie Party – New Facebook Game | We Zombie! 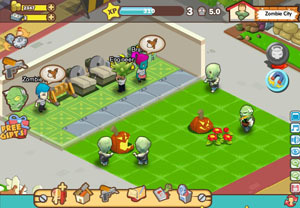 The games.com blog has a quick review of the new Facebook game, Zombie Party. It doesn’t sound all that exciting, but if I am missing anything, please let me know. “Contrary to what makes sense, the only way to safely kill zombies, at least according to the game, is to place bait items in your lawn that will lure them in. These bait items will slow a zombie down, as they are attracted to the items you placed (different kinds of zombies require different kinds of bait), giving you more time to kill them.”, says the review. Whatever happened to shooting them in the head? It sounds like the game is well-programmed, without a lot of bugs, but we’ll have to see how it plays out, so to speak.